Almond extract joins pale ale in a “beer cocktail” brightened with fresh-squeezed lemon juice—perfect any time of year. Photo courtesy McCormick. The mildly sweet, fruity taste of ale joins the bittersweet flavor of almonds to create this moderately sweet beer-based cocktail, the Almond-Ale Spritzer. While the recipe uses almond extract, serve this cocktail with a dish of almonds. 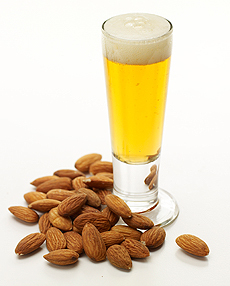 Ale and almonds are one of McCormick’s Top 10 Flavor Pairings For 2010. See all of the flavor pairings and recipes. See our Beer Glossary for the difference between beer and ale. Prep time for this spritzer takes just five minutes. For a nonalcoholic version, prepare as directed, using 1 bottle (12 ounces) micro-brewed ginger ale in place of the ale. Mix sugar and cilantro in 2-quart pitcher with a wooden spoon until the cilantro is crushed. Add lemon juice, ice and almond extract; stir until most of the sugar is dissolved. Stir in seltzer and ale; mix well. Pour into beverage glasses and serve immediately.